I visited 제주도 (Jeju island, South Korea) for the first time on 08-12 November 2006 to attend the 2006 International Conference on Hybrid Information Technology (aka ICHIT2006), where I gave a talk. 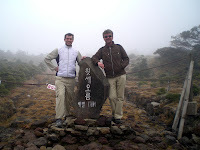 I had a great moment discussing while hiking 한라산 (Hallasan volcano) with Peter, one of the general chairs of the conference, though it was very cold. Besides, I had exceptional views from the plane during my flights between Japan and South Korea.